Our beloved Miss Daisy has begun her journey North of the Rainbow Bridge. Sadly, she lost her battle with cancer. She was a strong and courageous fighter, but in the past couple of weeks she had begun to slow down. Today, it was clear that her body could no longer fight and she was ready. Surrounded by love and showered by tears, Daisy passed quickly and peacefully. This little Siberian Husky/German Shepherd Dog never knew what she did or why her family gave her up after so many years of loyal companionship (they moved without her). Daisy was welcomed into rescue with open arms and she rewarded us with soft tail wags. She quickly realized she was with people who loved her and she is becoming a very happy dog again. She is good with people and other dogs and is easy going and a joy to be around. Daisy has been with MaPaw for over a year. Although she is 15 1/2 years old, this little gal can still be feisty. Our Miss Daisy had been slowing down and a trip to the vet brought very sad news ~ Daisy has been diagnosed with terminal bone cancer. 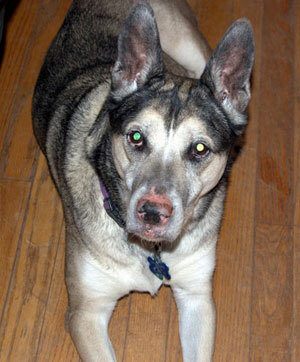 She will be loved and spoiled in our Husky Hospice program. Each day with her is a gift and we are delighted to share many kisses, hugs and kind words with her. Daisy has her own special bed and heated blankets to keep her comfortable.